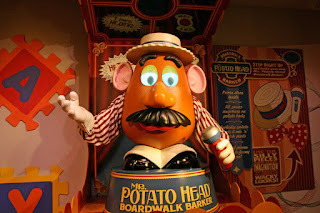 Memory 178 - A Day at Disney's Hollywood Studios 2: Part 11, Toy Story Mania! Come and join us for another installment of the WDW-Memories podcast, where I try to make it possible for you relive your Walt Disney World Memories when you can't actually be there. We'll continue our short day in Disney's Hollywood Studios as I have headed back to Pixar Place for a ride on the attraction everyone wants to ride when they come to this park. It's almost Christmas. Have you gotten your Christmas gifts yet? I've been enjoying the various Christmas programming. I have to hand it to Disney, they two shows they put out earlier this month from the parks just made me want to be there. I guess that’s the point right? After watching concerts on Main Street USA, or in front of Mission Space you just start remembering the fun you had and how much you would love to go back. But if you're like me and that's just not in the plans right now, how about a quick virtual escape in our minds instead. So as I said last time, it was a hot Sunday in June of 2012 that has changed into a cool rainy night. In memory 177, we changed our strategy and began looking for longer rides where I could stay dry as the storms continued, and with that in mind I rode the parks iconic attraction, The Great Movie Ride. As I exited the trams and made my way to the exit, I stopped once again to put on my poncho, then it's back out into the rain. We'll join the memory as we've just made our way to our next stop, Toy Story Midway Mania!. The line is not too long, but that means this will probably be my last attraction here, but honestly, I feel like I've done everything I wanted to, so that's fine by me. I'll get in line, and I may cut some of it out so you don't get bored just listening to the people talking around me. Once we reach the front of the line, I'm added to another group and we begin our spinning adventure through this park favorite attraction. My thoughts on this attraction are no secret, but I will say that my tip for this attraction is to ride it as the park is closing. They won't deny you entrance if you show up 5 minutes before it closes and there is a 20 minute posted wait. Often times, the posted wait can't keep up with how fast the line drops on this attraction, so it could be much less. Now sit back. Relax. Close your eyes. And come with me as I take a spin on this fun family favorite.